In February the Messenger put on a much requested social media course. Eight people started the course, but numbers increased as the morning went on. So who were we and why were we there? Interesting answers – ‘keep up with our kids’, ‘promote activities at the local library’, ‘to start campaigning’, and ‘advertise projects’. People do have reservations about social media because of horror stories about personal details being broadcast to the world. However, after we learned the three golden rules – only give out information that you would tell to your mother or your boss, only accept friend requests from people that you know and always log out from a shared computer – we were somewhat reassured. 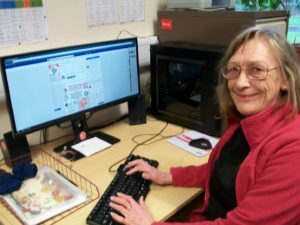 Setting up a Facebook account was the first task we had to carry out, and like all community courses, we learnt a lot from each other. So we went on to ‘find friends’ and ‘add friends’, and to learn how to fill out a personal profile. Exploring was the next stage. As many of us are not confident about clicking at random, Amy directed us to https://www.gcflearnfree.org/facebook101/3.3. This instructs you how to navigate between pages. The second half of the training was to understand the difference between the ‘Like page’ and a ‘Group’ on Facebook, and to be able to create both of these, and to discover new social media platforms and their functions. Setting up a group page is what interests me, as I am involved with various campaigns and this would enable me and others to promote events, share news, discuss thoughts, send collective messages, run polls etc. Hopefully more social media training will be on offer in the future.